The above figure shows the velocity and pressure curve while working fluid passing through the blades of velocity compounded turbine. Here the kinetic energy (velocity) is extracted from working in multiple stages. This is known as velocity compounding. Figure show the arrangement of a velocity compound turbine. The turbine has adjacent rows of moving blades and fixed blades. The moving blades are keyed to the same shaft. Here the working fluid is a steam. 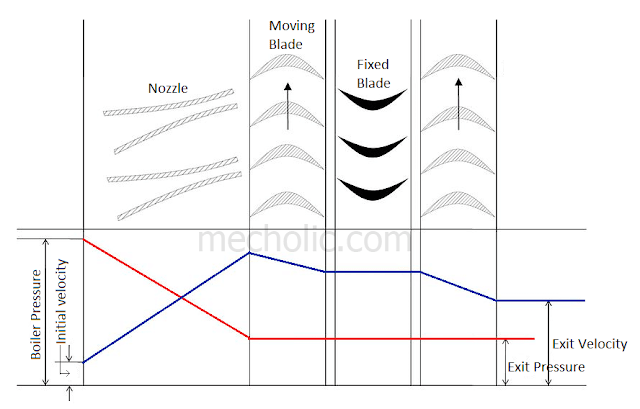 Initially, the steam from boiler having high pressure and low velocity is directed to moving blades through a stationary nozzle. The steam completely expands in the nozzle, as steam passes through the nozzle the total enthalpy drop and hence the pressure of steam drops. At the same time, the velocity or kinetic energy of steam increases according to the Bernoulli’s principle. The portion of the kinetic energy is then absorbed by the row of moving blades, impart a rotation on shaft. The velocity of steam is decreases and pressure remains the same while it passing over the moving blades. The steam is then pass through the fixed blades without any change in velocity and the pressure (the velocity will slightly drop in practical application). The purpose of fixed blade is to redirect the steam to the next rows of moving blades where again work is done on rotor with dissipating kinetic energy. Finally, the low-velocity steam leaves the turbine. Fewer number of stages and length of turbine is short. Due to fewer stages, the space required and initial cost is less. Low-pressure operation, so the leakage of steam is less. Since it works at low-pressure turbine, blades need not be very strong, stress on housing also reduced. Reliable and easy to operate. Very large heat drop in the first stage. The steam temperature is low at second and third row of wheel, there for cast iron can used for cylinder. This will reduce material cost. Low efficiency because of the ratio of blade velocity to steam velocity not optimum for all wheels. High frictional loss due to high velocity. Special designing and fabrication is required for blades which can withstand high velocity. First stage produces maximum power, work produced in the low-pressure stages is much less.